If I ask about your favorite media player, most probably your answer will be VLC for computer and MX for mobile platform. But what make these apps to be at number one position? First of all, both of them have many things in common. For example, you can amplify the volume up to 200%, you can stream online videos and much more. These features are rarely available in other media players. Comparing from performance to appearance, both these applications are perfectly designed and I personally use them as my primary choice. 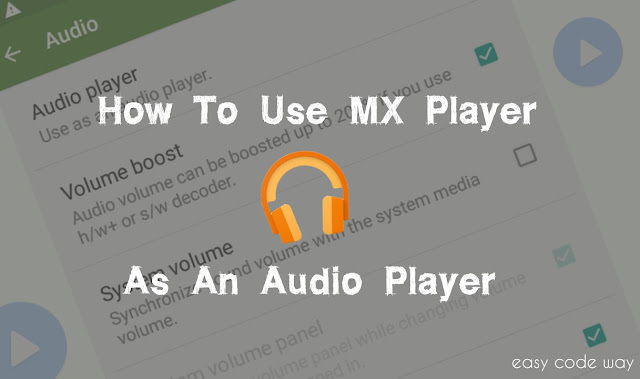 Now coming to the main topic, there is an interesting news for MX player users. 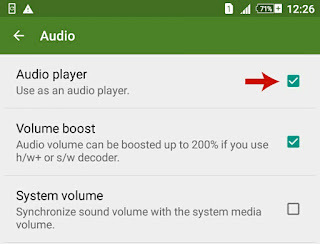 Basically we use it to play videos but now in latest versions, you can also use it as an audio player. 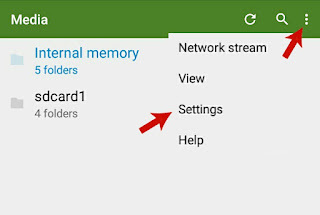 Though this feature is hidden inside settings but here I clearly explain how to use and customize it. So lets begin this tutorial now! I wonder why MX developer hasn't added this feature to their default list. Speaking frankly, I think that this feature is experimental and still under construction. Well there is no official statement about this but as for now you can follow these manually steps to enable this feature. A menu list will appear, select "Settings" from here. Under settings, click on "Audio". Now you'll find "audio player" option. Simply tick mark the button next to it. Finally go back to the home screen and click the refresh icon to add audio files. 1. After above 5th step, you'll find an option as "volume boost". Now tick mark or untick the button next to it to turn it on or off respectively. Go to MX settings and click on "Player". 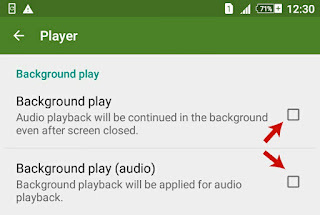 Now scroll down and tick mark the "Background Play" options. 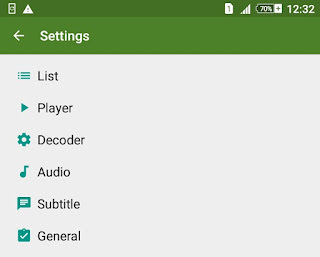 You can also customize the video or audio playback separately. The disappointing part here is the major drawbacks of this MX audio player and I think these are the reasons why this feature is not completely out yet. Below I had prepared a list of 5 major problems you'll face. There is no shuffle or repeat song feature. You can't filter songs on the basis of albums or artists. There is no feature to create separate playlist. You can't edit music information's like thumbnail, year, artist or album name. Instead of these negative points, I love to use this app as my primary choice. The only thing I love is the boost up in volume and you can also take advantage of this. So now sit back to your chair, keep calm and listen to your favorite music with MX Audio Player. This trick is applicable on all major platforms (i.e., on Android, Windows or iOS) . How was your experience? Finally, if you have any doubt or question regarding this topic, please let me know in below comment box. Oh No! I forget to wish you on this day. Happy new year guys. Love and blessings from my side. Great idea. However you may try to use Jetaudio with Bongiovi effect enabled. It will make most songs louder and better sounding. Try it for yourself and compare with MX.